Union Minister for HRD Prakash Javadekar has said that KVs and NVs are a role model for the Government School system in India. 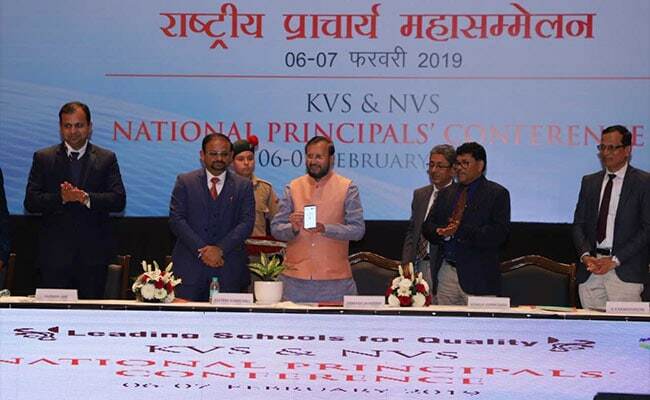 On the second day of KVS-NVS National Principals' Conference, the Union Minister for HRD Prakash Javadekar said that Kendriya Vidyalayas (KVS) and Navodaya Vidyalayas (NVS) are a role model for the Government School system in India. He was addressing the Valedictory session of KVS-NVS National Principals' Conference on Thursday at Siri Fort Auditorium in New Delhi. The theme for the conference this year was Leading School for Quality'. On the occasion, Mr. Javadekar alos launched the FitKVian App for the ambitious programme Swasth Bachche-Swasth Bharat. The FitKVian App will facilitate the fitness assessment for 12.7 Lakh Children across 1199 Kendriya Vidyalayas throughout the country, capturing real time data. This App will have Interfaces for different stakeholders (KVS HQ, ZIETs, ROs, Schools, Parents) and Analytics & Benchmarking will become easy and accurate with this technological intervention. Ms. Bina Ray, Secretary, School Education and Literacy, also addressed the conference and appealed to the leaders to innovate. She also launched the GIS website and Mobile App of Kendriya Vidyalaya Sangathan on this occasion. All the 1199 Kendriya Vidyalays of the country have been mapped on this app and KVs can be located by a single click. It has various facilities like selecting different basemap of NIC and ESRI (Street, Aerial, Satellite, Terrain, Topo). This facility can be viewed at www.kvsgis.nic.in. Mr. Anurag Tripathi, Secretary, CBSE, also interacted with the Principals on various exam reforms introduced by the board. Swami Shantatmanand from Ram Krishna Mission, who was also in attendance, addressed the august gathering on Value Education in Schools. Commissioner KVS, Sh. Santosh Kumar Mall and Commissioner NVS, Sh. Biswajit Kumar Singh were also present on the second day of the conference along with other senior officials of both the organizations. The finalist of Zee TV SaReGaMa show Ms. Ishita from KV Bhopal performed at the conference and earned praise from the HRD Minister.